Re: Hide site, retirement site. Just firewood. It really doesn't get that cold here. So far this season 27 is the lowest low. Shop heater might not be a bad idea though. Nice job and nice to have out of the way I bet. OK, the Bus is back in the shop parked. It has the new exhuast and muffler in the back seat along with the caliper paint, water pump, a few Diode Dynamics, LED etc. Didn't get to work on it this weekend. Was finshing the firewood rack and the garden. POR is interesting stuff. You think with a name like Paint Over Rust, that it would just be brush it on....no. Clean and degrease with their cleaner. Then spray metal prep and keep wet for 20 minutes. Then rinse. Then paint. This stuff better be good. It looks good. Several sags on the vertical, but its just a firewood rack. Then it was harvesting all the carrots, beets, chard, and lettuce and spinach and finishing the enclosure with more wire fencing. Previously it was just 6 foot up the sides. Now completely wrapped over the top and sides. No critters getting into this one this summer. Added bracing in the middle, finished the electrical, and started on the second part of the irrigation system. Brought in about 6 FEL of mushroom compost and will till it in next week. Started my seeds indoors for now. Heirloom tomatoes, purple hull peas, squash, cucumbers, herbs, onions, peppers. Long weekend. Good to be sore. 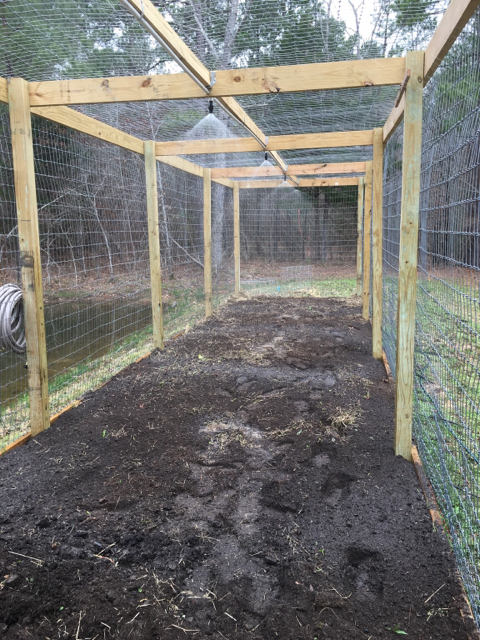 Finished tilling in the mushroom compost and finished my seedling sprinkler system. Wanted to water from above when starting seedlings and then switch to drip hose between rows once they are established. Any chance of hogs chewing thru that fencing? what, no cool night sight sniping?! This means war. Two weekends in a row, I've come to the place to find my feeder down. That damn pig is making himself a pest. Last week it was knocked down, legs off and the lid off and drug out in the middle of the woods,empty. I welded it up and got it all back set up and full of corn and last night, according to the camera, he knocks it down again. didnt get the lid off but a bunch spilled out. I fixed the AR FTF issue with a buffer spring, the PVS14 is on and I'm going to stay up tonight. Its going to be me or him. I wish my buddies and their dogs were here, I'd hunt with dogs and stick him with a bowie up close and personal. Good luck, glad you fixed the rifle. The man is going full in Rambo! hopefully there will be a dressed and hung hog pic tomorrow! Ok. Welds up a new feeder stand. Solid steel pipe and cross bracing. 4 ft no 6 rebar stakes with brackets welded so I can bolt the legs to the stakes. He'll need a back hoe to turn this one over. 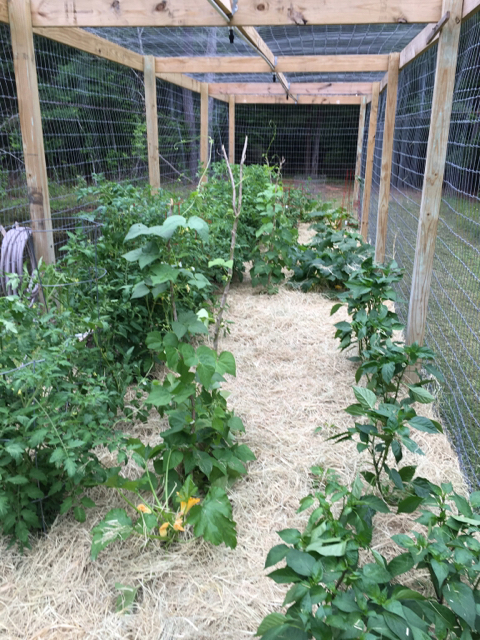 Also weeded the garden a mulched with some hay. 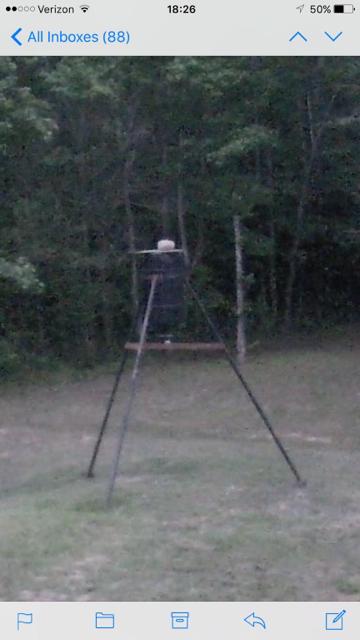 I have a security camera on the feeder and I can lay in bed and watch it at night. Then I can open the living room window and use the end table as a shooting bench to wack him. just a matter of time. well got up here late today. Oldest had a sleep over and the youngest is with mamma at a dance convention. Put in a pond aerator and today I wired up the timer for it. I'm only going to run it about 5 hours a day to keep the electrical use down and that should be plenty for the fish. So with all that running around I didn't expect to see the hog tonight. I pulled all the game cams and they aren't taking pictures consistently. They should have had pictures of my running around on the tractor. I'll need to try batteries first. 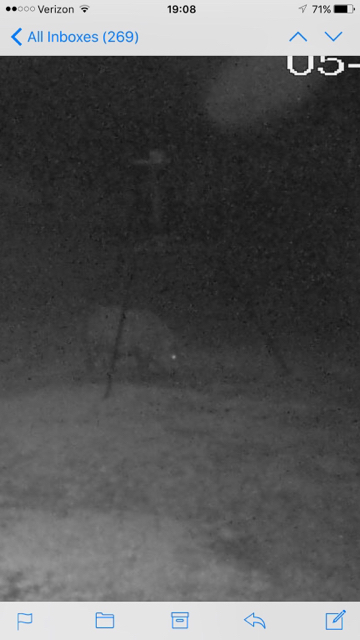 So, settling in for evening I turned the security camera on and there the pig was. I got the window open and set up for the shot. The Comp M2 on this AR is not exactly co-witnessed correctly with the PVS14 so the image is a little off. I popped him but he ran into the woods. I started in after him but decided that a wounded 250lb hog might be a formidable enemy in the dark in the dense woods. I'll go look for him in the morning. Do a solar panel with battery on the pump. Run and charge during the day, let the battery run it at night. Fish are happy, no elec bill. What does a solar panel cost? Could that actually pay back in a few years? Not a bad idea JR but this is a 1/2 HP motor driven aerator. Had I gone the compressor bubbler that would have been the ticket. So went out this morning to look for the pig. He was in a hurry when he left so he was leaving some tracks. No blood trail I could see. Hmm I know I hit him because he jumped. Followed the tracks for a ways before they got mixed up in his routine trail which I lost at the creek. I wasn't planning on eating him anyway but I wanted to laugh in his face for knocking over my feeder twice. Apparently I missed. I'm guessing my zero is off. It was only 125 yards. Now you get to try again! You can get them for around $.50 a watt looking on CL, but $1 a watt is considered. 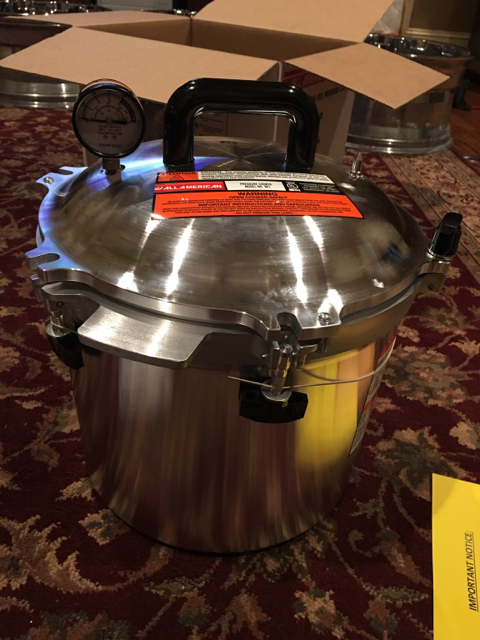 Here in the bay area there are lots of dealers so deals are easy to find. I have smaller panels (24x38) that are 100watt, but the ones on my house are 250 watt and are 30x63. I like mono panels as they put more in diff light, but not as much as poly panels which are better in on direct sunlight. Most new panels are good for 25+ years so it is a long term payoff. My house system saved me around $1500 this year, but cost 18k. However I also got a 30% tax credit on that so real cost is 12k. Them hogs are good freezer fillers. When we go to the lake, we like to hunt hogs from the boat..come to think of it, we should do that soon. RN, grab a different tool from the safe and finish up. Wonder if this would be a good enough excuse for a PVS22? A magnified image would be nice. Or maybe I'll just duct tape the pvs14 to the front of my 3-9 on my titanium hunting rifle. I would say quit fartin around and just get you one of these! I like the idea of a clip on. Hmm, hunting from boats mean they can't chase you. LoL We hunt from a boat because it's the only way to get to the area we shoot them at. Last one I killed was at 130 yards. 45.70 lever no optics. Full moon hunting...time your shot to the wave action...and down they go. You need a claymore array under the feeder - click, click and you're BBQing! But the resulting backblast would destroy the feeder. Sorry Tex, but that's funny right there. You guys really like the top end stuff!! I am looking more like this. Nice thing with a clip on is you can change weapons without loosing center and use with reflex or regular scopes. That is even a little pricey for me, I think gen 2 is just fine. One of problem is the mount I'm using. It's perfectly co witnessed with my Comp M4 set up on the SBR but the mount on the AR with the Comp M2 is a bit higher so it's hard to get a good picture through it. Are you using the half moon spacer with the M2 or no? Minot familiar with that Bobby. Break it down for me. Garden is going well. So much rain as made the squash a challenge. What mount are you using for your M2? Are you saying your AP is slightly too high or is the NVG? Is it a stock mount or did you throw it in a LT mount?